Categories: Aqua / Turquoise, Pink. When people talk about uniqueness and something that is like nothing else in the world, there are two things that spring to mind. Snowflakes and fingerprints, and while a snowflake wedding invitation would be perfect for a winter wedding, it would seem slightly out of place for the rest of the year. This is why a couple wanting to declare their love in a unique and personal manner will find that the Fingerprint Heart wedding invitation collection from Feel Good Wedding Invites is the ideal way to share the good news about their forthcoming wedding. The two fingerprints are overlaid to form the shape of a heart, so if you are looking for something that is unique, romantic and very cool looking, this is a great collection. It is possible to customise the colours of the cards so you can make the fingerprints look even more personal. Whether you have a colour scheme for the wedding or you want to showcase some of the things that you love, this wedding invitation is the perfect way to do so. 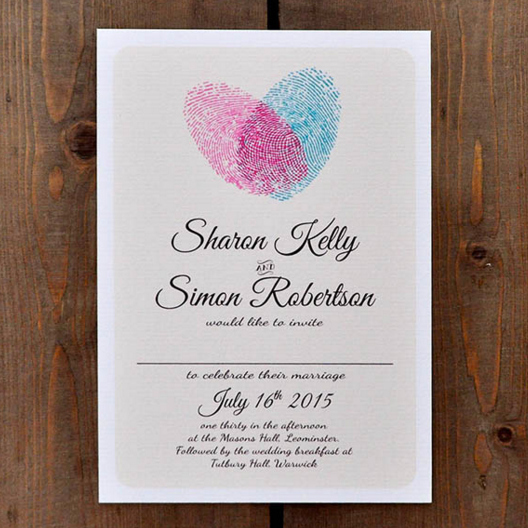 The textured card ensures that the card feels as good as it looks and if you are looking for a complete stationery set for the special day, the Fingerprint Heart range is entirely suitable. Additional stationery options like RSVP cards, save the dates, thank you cards and Order of Services are all available to choose from. This is the style of wedding invitation that your guests will immediately give the thumbs-up to, so if you want a great looking invitation that symbolises your unique love, you won’t get a more attraction invitation than this set.